Before I even started out on this recipe, it had several things going against it. Three strikes. 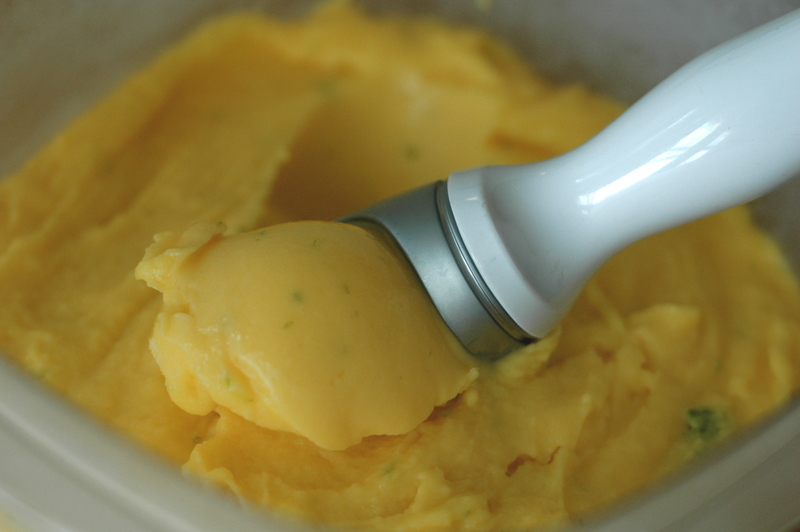 First, it’s Mango Lassi frozen yogurt. Lassis have never sounded in the least bit appealing to me. I’ve been to India, and frankly, the idea of stopping at a roadside stand to bake in the sun while drinking a savory yogurt drink would never have crossed my mind. I’m sure I’m wrong about lassis- I hope I am. But, yeah, they’re not exactly my favorite way to cool down on a hot summer day. 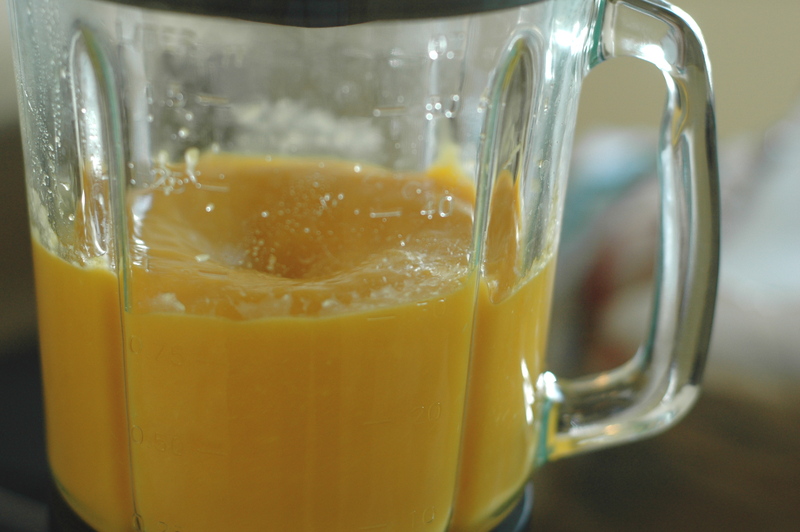 Secondly, as I skimmed through the recipe I realized it called for both 1)pulling out my blender (wah!) and 2)straining the pureed fruit (double wah!). Combine those things with the ice cream maker, and I would be doing a lot of dishes. Another strike. Third, mangos don’t grow in Illinois. Unlike pretty much everything else I could want right now. It seemed like kind of a waste to go buy a bunch of mangos while my fridge and counters are chock full of zucchini, cukes, tomatoes, eggplants, melon… well, you get the drift. So, in the end, I have no idea why I even bothered. Well, I kind of do. 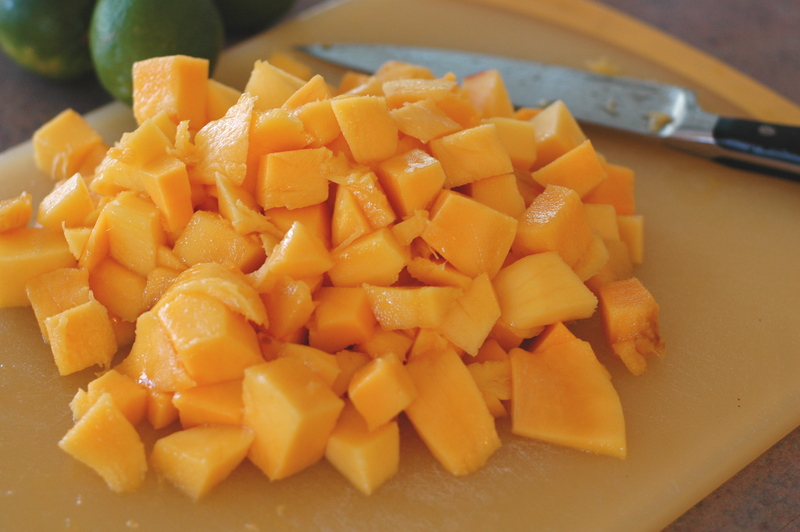 I love mangos. Even if they don’t grow here, they are in season somewhere because the ones I got were amazing. And the addition of lime and salt made me think of margaritas, (which, ahem, I also love). 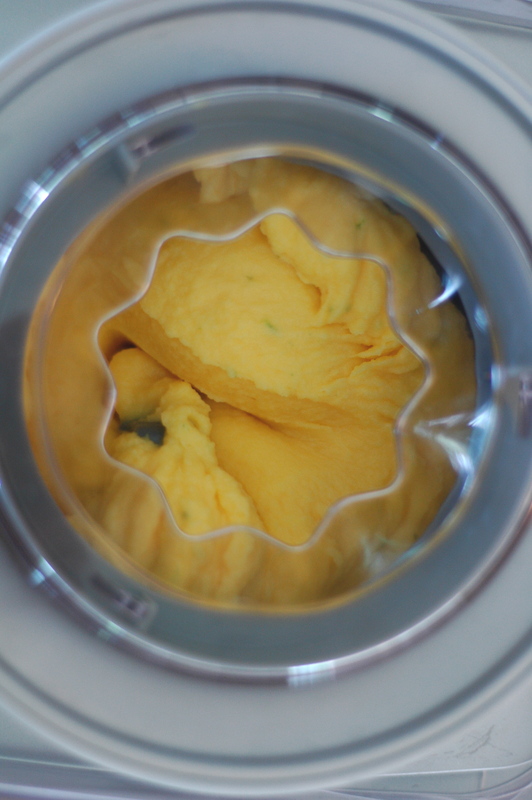 Also, I can’t get enough of my ice cream maker. I use it all the time. It makes me sad to think of all the ice cream makers that I’m sure are shoved to the back of cupboards, long-forgotten wedding or holiday gifts, getting no appreciation, but bursting with potential. I was, however, stuck in a vanilla fro-yo rut, and needed something exciting to snap me out of it. Ok, enough talk about my motivation to get this done. I don’t care about it anymore. All I care about is spooning bite after delicious bite of this stuff into my mouth as quickly as possible. You guys. It is SO good. I was so wrong. My concerns about straining seem so petty now. I’d strain a million mangoes for this stuff. 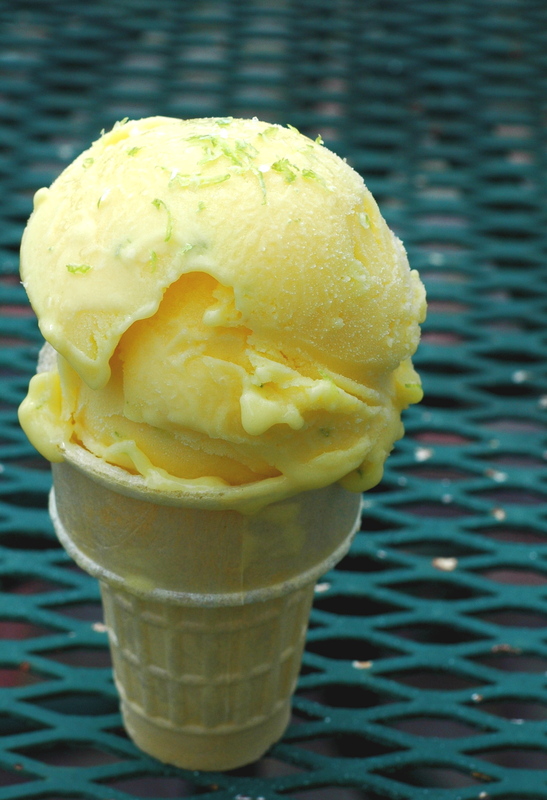 It’s sweet, tangy, and a bit salty, all in one, hitting every taste bud on your lucky little tongue. Often, frozen treats let you down in the taste department, because they don’t appeal to your sense of smell, and freezing something dulls its flavor. But I can tell you, that is definitely not the problem here. This frozen yogurt is a flavor bomb, in the best possible way, like a scoop of summer. And what is amazing about the stuff is that despite being made in a home ice cream maker, the texture is surprisingly smooth and creamy, as opposed to the iciness that is typical of homemade ice creams. It’s more like a sherbet than frozen yogurt, I suppose. Whatever it is, can I urge you to go make some right this very minute? Please, do not wait around like I did, and let another precious summer day go by without a container of this frozen yogurt in your freezer. 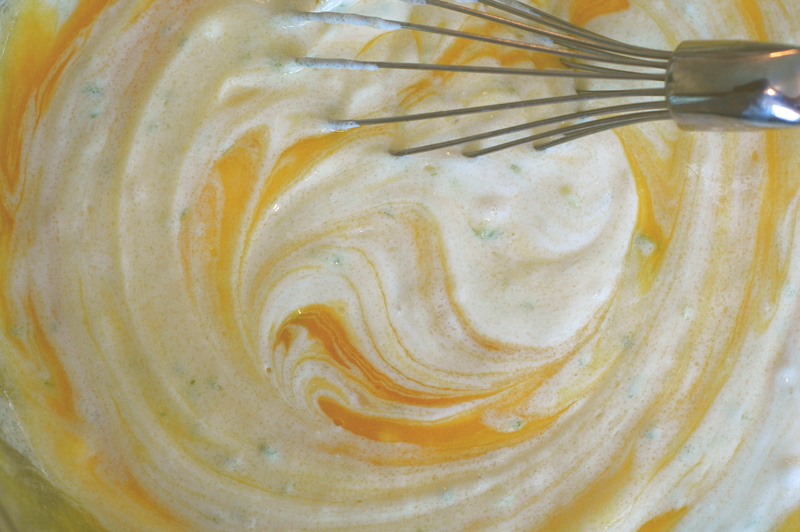 In a medium bowl, whisk mango purée, yogurt, sugar, and lime zest until well combined and the sugar is completely dissolved. Add lime juice and kosher salt, tasting frequently and adding more if needed. 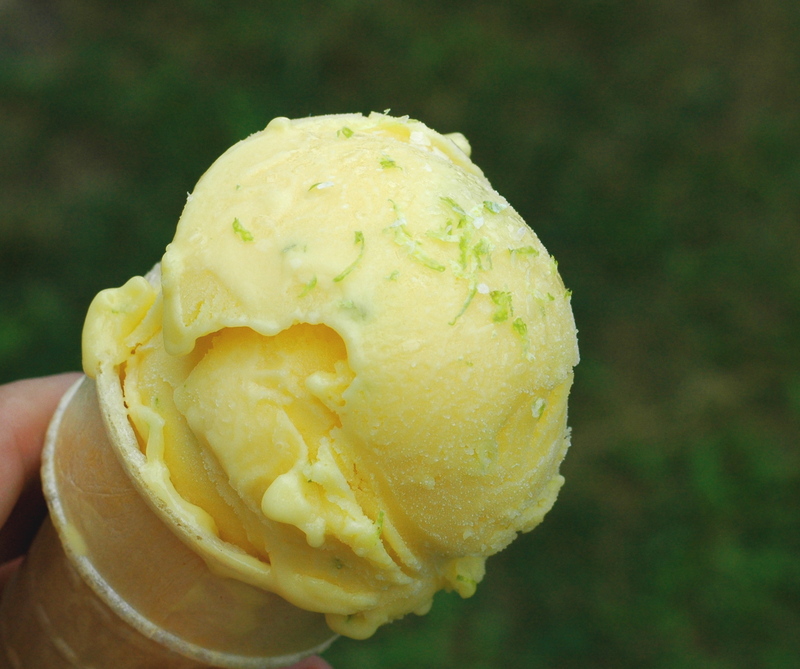 To serve, you can top a scoop with a bit of lime zest and a small sprinkle of kosher salt. 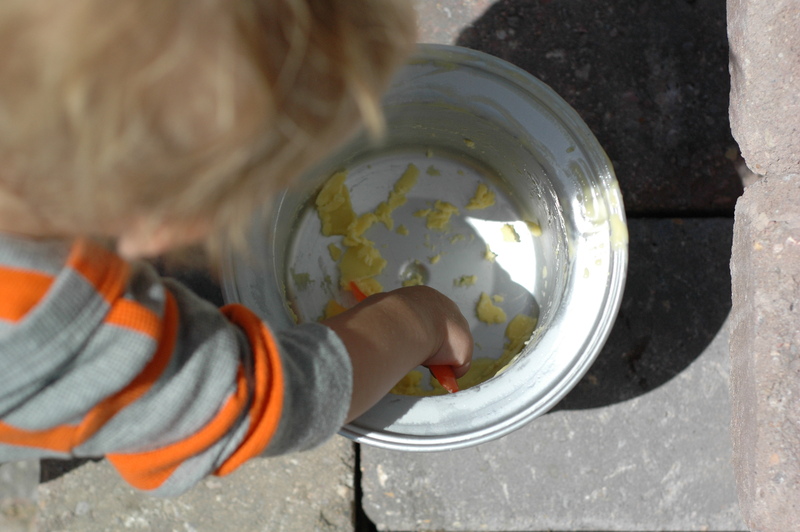 *Don’t forget to scrape up the tasty bits from the bottom of the freezer bowl! Yum!! 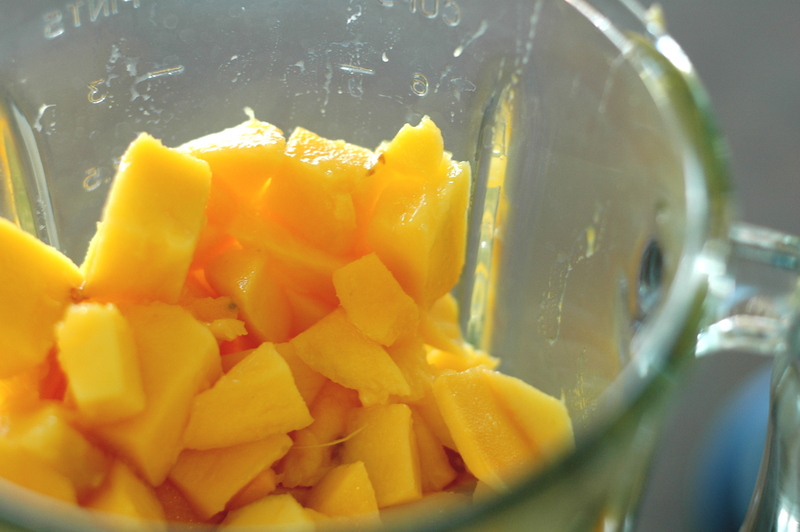 I just made homemade peach frozen yogurt recently but this looks SO MUCH BETTER. I love all things mango lassi related… 🙂 I also love that lime zest on top!